Thanks to Rob for getting busy on this! We think we might have some progress on removing two obstructions which have injured cyclists in the past - hopefully more news about that soon. The Extons-Rollesby barriers were formally reported on 18 Jan and apparently they were opened for a day or two and then closed again - Rob's trying to get to the bottom of that one. Norfolk CC sent us a copy of a 2015 definitive map in the area of the Route 1 narrow/steep-sided wooden fence at the Castle Rising bypass which is different to a 1995 definitive map in the BUG archives, so that needs checking and probably further action. The new bollards at Lynnsport seem to be the Borough Council's fault, breaking their previous promise to preserve Route 1. Apparently it's to stop motorists driving on Route 1, but that didn't make sense to us because the barriers are in the middle of Route 1 and not where motorists might get onto it, plus there are other barriers on other cycleways. The particular bollards used are also unsafe because they're a low-visibility design and installed on a bend. We will keep working on this. Lynn-Hunstanton and Lynn-Fakenham former railways have been budgeted £95,000 each for feasibility/planning by Norfolk County Council at a committee meeting on 29 January 2018. One of us was on BBC Radio Norfolk that morning, welcoming the plan. We're particularly hopeful that these could offer solutions to the missing links Snettisham-Heacham, Gaywood-Pott Row and Grimston-Hillington, as well as improve weak links like West Winch-South Lynn and the Woottons-Wolferton. 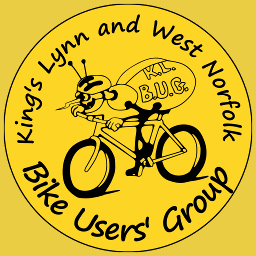 We participated in a meeting convened by South Lynn division county councillor Alex Kemp with people from Norfolk CC (officers working on Walking and Cycling Strategy, Lynn Transport Study and a consultant), Norfolk Coast Partnership, Harding's Pits Community Volunteers, Gaywood Valley (?) and the Harding's Way petitioners. There should be stakeholder meetings and Alex Kemp will be invited to pass on invitations to local community groups, so we might actually be involved this time. More outcomes to follow, but Norfolk Coast Partnership would be interested if we could add their cycle route details to openstreetmap - anyone willing to help? One thing arising from Alex Kemp's meeting seemed to be a general interest in raising awareness of non-motorised traffic levels at key points. There's some old data on WhatDoTheyKnow what we've not yet publicised, as well as the revelation that the automatic cycle counters are being switched off. We should publicise this on our website, as well as relevant data updates from elsewhere. RAF Heritage Arts Trail - suggest for a summer ride. Downham Market 56188 - extends the 20mph speed limit to new bits of the Bennett Street area. Hockering - 55992 and PJ8038 Hockering (VF55992) - sets a 40mph limit from Park Lane to Stone Road. Docking - Choseley Road 30mph SL - extends the 30mph northwards by 40 metres. Hunstanton Cromer Rd 56189 PR3735 V1 - extends the 30mph to between Chapel Bank and Lighthouse Lane. We have objected to this as unsafe because it seems likely to result in accelerating/decelerating motorists watching their speedometers at a point where they should be watching for people crossing between Chapel Bank and Old Town Way. We suggest extending the 30mph limit the remaining 300m or so to join up with Old Hunstanton's 30mph and avoid the drawbacks of motorists accelerating and braking for such a short stretch.